Ouch. This movie hit hard at the end. 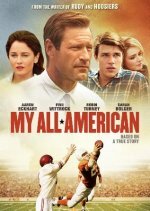 Last night my brother recommended My All-American. Tonight, I needed a break from playing Grand Theft Auto and decided to watch the movie. After watching this, I feel differently toward the Texas Longhorns. I’m not necessarily a Sooner fan, but I feel more in key with the Sooners, and, well, the Longhorns are the Sooners’ top rival. During the first half of the movie, it feels kind of like Rudy. Freddie Steinmark is shorter and lighter than your usual college football player, but his dream comes true when Coach Royal of the Texas Longhorns recognizes his talent and offers him a full scholarship to attend the University of Texas. Freddie soon becomes a starter and plays the safety on defense. His role on the team is a big part of the Longhorns’ successful season. After the last regular game–before the Cotton Bowl, Freddie learns that a limp he had during the last few regular games is not a football injury, but is instead a tumor. It’s a bone cancer and the doctors have to remove his leg. Freddie does make it to the Cotton Bowl, to be with his team while they play, but he dies a year and a half later, on June 6, 1971. He was twenty-two years old. To this day, the Longhorns continue to honor Freddie Steinmark. His memorial is in the stadium and the players touch his picture on their way out to the field.